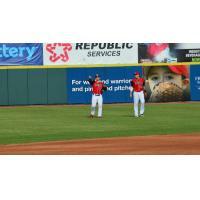 Hickory, NC - The Crawdads fell to the Greensboro Grasshoppers 3-2 on Sunday evening. The Grasshoppers got on the board first, scoring two runs in the second inning. The 'Dads responded in the home half of the inning with a run of their own to cut the deficit to one. Yohel Pozo doubled to right and advanced to third on a fly out by Preston Scott. Miguel Aparicio brought Pozo in to score with a line drive single. The two teams traded runs in the fifth inning to make the score 3-2. Clay Middleton doubled in the bottom half of the inning. Justin Jacobs drove him home with a single to right. The season wraps up tomorrow with a Labor Day Matinee at 1pm. The 'Dads will be auctioning off their patriotic jerseys that they have been sporting on select dates this season. The proceeds from the auction will be donated to the Disabled American Veterans, thanks to StratX. The Crawdads will also be giving away 200 mystery items to fans as part of fan appreciation day. The items range from signed baseballs, to bobbleheads, and broken bats. It is also Make A Difference Monday, presented by Catawba Shoe Store, and fans that donate at least $5 worth of school supplies to Classroom Connection will get a free ticket to the game.